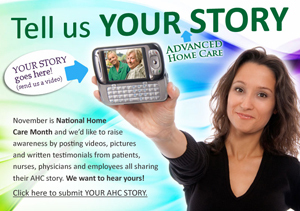 Advanced Home Care: Share YOUR AHC STORY! November is National Home Care Month! To raise awareness and help us celebrate, Advanced Home Care is asking patients, caregivers, physicians and employees to share their AHC story. It can be in the form of a video clip, picture or even a written testimonial. We want to know what your experience with Advanced Home Care has meant to you (or your loved ones). It could be a story of help in the home or the way we have influenced your life, the life of a loved one or your practice…all entries are welcome! We will select a few submissions to post on our YouTube, Facebook and Twitter accounts. Help us tell the story of how Advanced Home Care has made a positive impact on your life as we celebrate National Home Care Month in November. See what others have sent! To share your story, read the form below and click the “I Agree” button. Upon doing so, an email window will appear, allowing you to share your story and attach your video/picture. By clicking the “I Agree!” button below, I state that I have read and understood this Consent and Release Form and I hereby consent to and authorize Advanced Home Care, Inc. to take and/or use digital or printed photographs or motion pictures of me, publish written testimonial and interview notes; to produce videotapes, audiotapes, closed circuit television programs, web casts, or other types of media productions that capture my experiences, name, voice, image and/or likeness (any of the foregoing types of media are called the “Materials” in this Consent and Release form). I authorize Advanced Home Care, Inc. to copyright, use, reuse, copy, publish, display, exhibit, reproduce, license to third party, and distribute the Materials in any form of media, which may include, but are not limited to articles, magazines, newspapers, blogs web banners, press releases, brochures, websites or publications, electronic or otherwise, without notifying me. I agree that Advanced Home Care, Inc. may identify me by name, and such other identifying information which may be needed. I agree that I am participating on a voluntary basis and I will not receive any payment from Advanced Home Care, Inc. for agreeing to this release or due to any publication, usage or distribution of the Materials. I agree to allow Advanced Home Care to contact me.